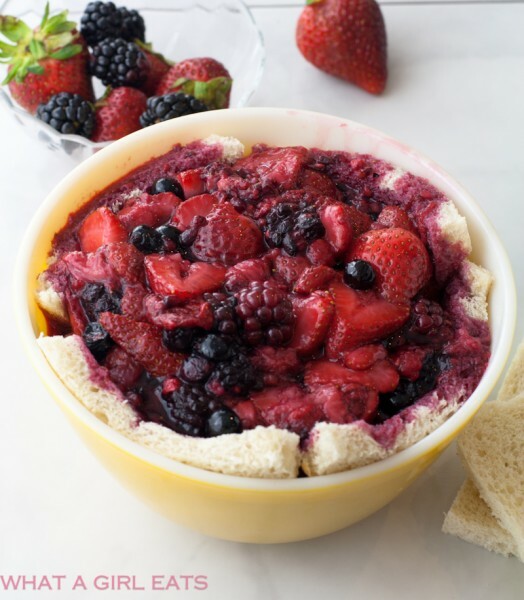 Classic British summer pudding is a delicious dessert.Fresh berries are pressed overnight to make this light summer treat. Here’s the recipe to make it! The year and a half I spent in London, I worked at a couple of different places. Nearly every Saturday I would take the tube from my flat just off Sloane Square, to Wimbledon, where the catering company I worked for was located. We did a lot of weddings and I would spend the morning helping cook whatever food we hadn’t prepared the night before. Then I’d finish making the summer pudding desserts that we would be serving as an alternate dessert to the actual wedding cake. If you’ve ever seen or had a traditional British wedding cake, you need a chisel and hammer to break through the royal icing. It dries rock hard, to protect the fruit cake that is below the surface. The word “pudding” in Britain has a completely different meaning than it does in the United States. Pudding simply refers to any dessert, and it does not have to be custard based. 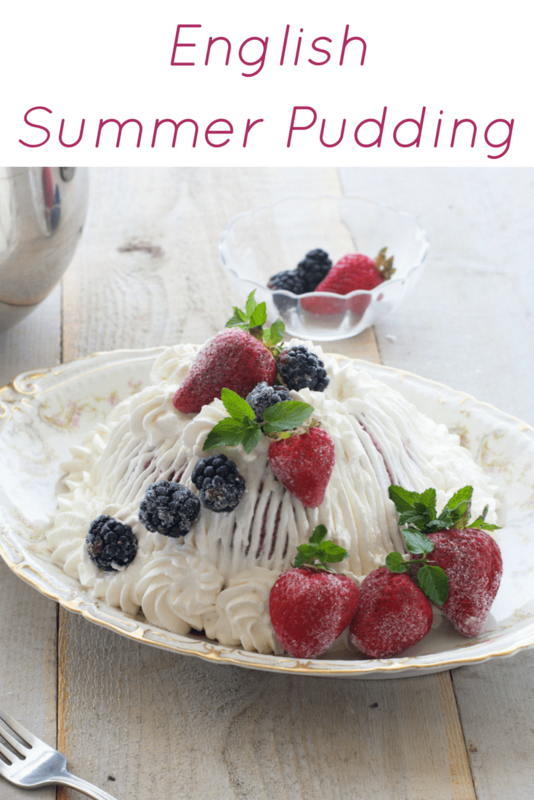 This summer pudding is just fruit cooked with a little sugar, poured into a bread lined mold, and refrigerated overnight. We used empty, 5 pound sized coffee cans and round bowls to make the puddings. On Saturday mornings I would whip cream, sugar coat jewel-like red currants, and decorate the puddings. I’ve never seen red currants in any grocery store in Los Angeles, so I finish mine with more fresh berries. While this is a super easy dessert to make, you do need to prepare it a day in advance. For my gluten and grain free friends, I reserve a portion of the cooked berries before filling the mold and serve with fresh whipped cream. Line bowl with sliced, trimmed bread. Fill with berries. Line a 1 1/ to 2 quart bowl with sliced white bread, trimming to fit. 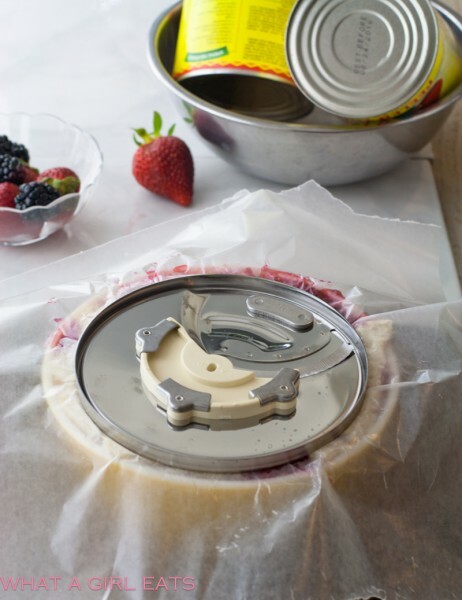 Fill with fresh cooked berries. Top mold with additional bread to seal the “pudding”. Cover pudding and weight down with something heavy if you don’t have a traditional pudding basin. (You can see I don’t, so I use a disk from my food processor and heavy cans). Un-mold pudding on to a serving platter. Use something heavy to weigh down pudding overnight. Place on a cookie sheet so it doesn’t drip all over the fridge. Top with fresh whipped cream. 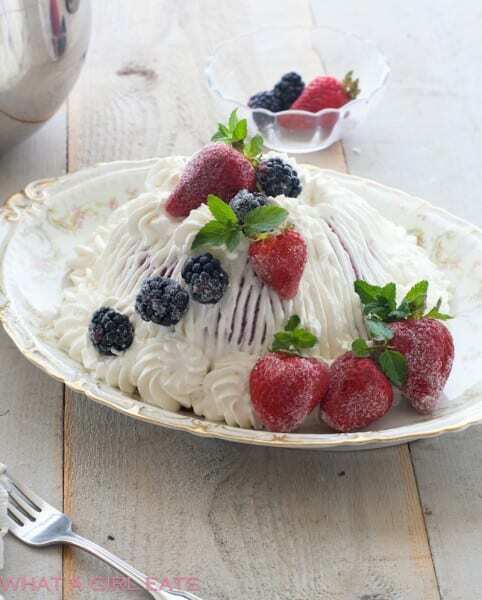 I use a fork for the outside of the summer pudding, adding a few whipped cream swirls and a few more fresh berries. 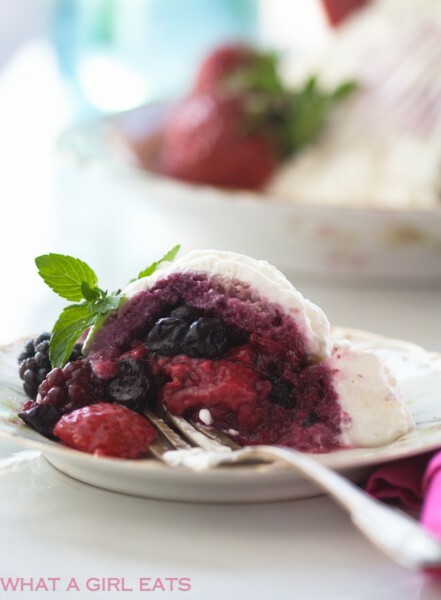 Summer pudding with fresh whipped cream and berries. Any left over berries, I reserve for my gluten free or grain free friends. 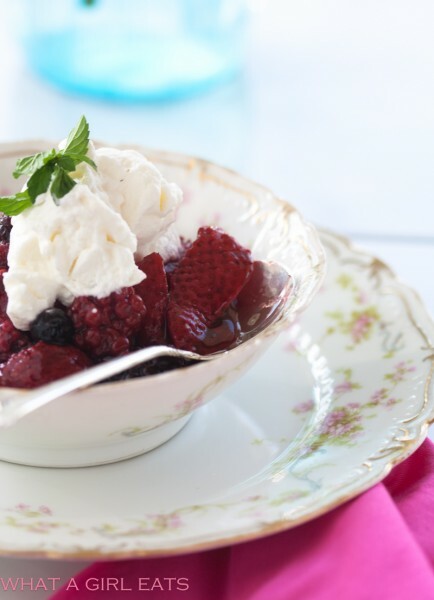 Cooked summer berries with fresh whipped cream. About 3 1/2 pounds assorted berries sliced. I used 2 1/2 of fresh strawberries and a pound of frozen mixed berries from Trader Joe's. Line a bowl (I used a 1 1/2 quart pyrex bowl) with sheets of plastic wrap so that you'll be able to easily unmold the pudding. Trim the crusts of the bread slices and butter them on one side. Line the mold with the bread slices, cutting to fit all the gaps, buttered side toward the bowl. In a saucepan, add berries and sugar and bring to a simmer. Cook gently for about 10 minutes, just until sugar dissolves and berries release their juices. Top the berries with more buttered bread slices until the entire pudding is encased. Cover with plastic wrap, and a plate that's slightly smaller than the bowl. Weigh the plate down with some cans and refrigerate overnight. Whip the cream until peaks form with sugar and vanilla. Cover the whole pudding with the whipped cream. Finish with berries and mint. To serve, just scoop it like a trifle or ice cream. Serves about 10 to 12 depending on how big your portions are. I usually make it when I'm going to have a big crowd. 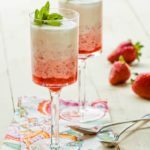 Looking for more classic British desserts? 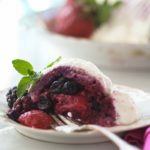 Classic British Summer pudding, with fresh berries and whipped cream. Thanks Fabiola, it makes great use of summer berries! This is so cool looking! 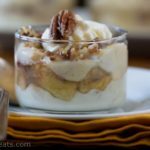 I’ve never heard of this kind of dessert before, enjoyed reading your post and learning all about it. Sounds and looks so good! Thanks Steph…I made hundreds of these when I was working at the catering company! Thank you Matt. This is the main dessert (after the traditional british wedding cake) we served when I worked for a catering company in London. I made hundreds of these, so I had a lot of practice! This pudding is just wonderful! !